We have recently had the opportunity to review a Digital Photo Clock Frame from ZAZOO KIDS. Located in Chicago, Illinois, the founder of the ZAZOO photo clock frame is a mother of 3 young children. She developed this concept several years ago while searching to purchase something similar. 6. After having three "bad" sleepers, and being sleep deprived herself for years, the founder decided to move forward with the concept of showing the kids the time before the kids can actually read a clock. 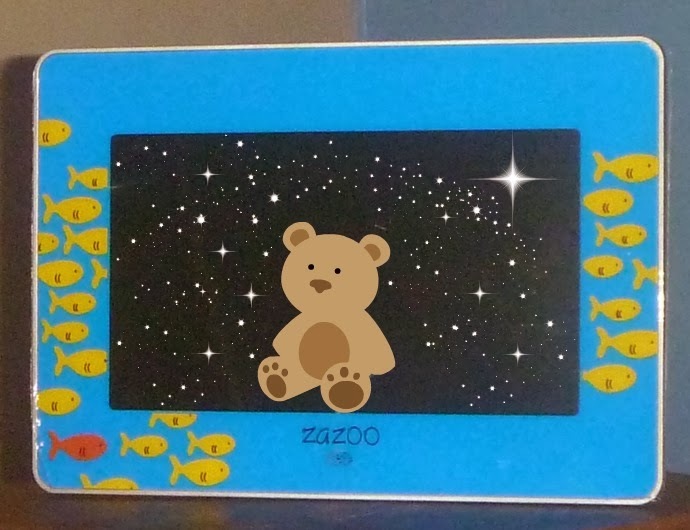 ZAZOO KIDS Photo Clock Frame is a rotating digital photo frame, audio book player, music player, and it is most importantly a guide to help young children know when its time to sleep and get up. The back has a sturdy fold out leg to ensure stability. The side of clock frame has USB port and slots for SD cards or flash drives making uploading easy, or there is already photos, music, and stories programmed into clock. The remote control is easy to use, or there are buttons on the back to navigate through the menu. The ZAZOO KIDS Photo Clock can be customized with personal pictures for awake and sleep images. There are also pre- programmed options. ZAZOO KIDS can now download your child's name to their photo clock. They have a current listing of names on their web site and if your child's name is not found, they request you contact them and they will do their best to accommodate the request. They also have images for birthdays and other special occasions. Well known children's artists are featured on the photo clocks. There are 11 songs built right into the memory. Some tunes are ScribbleMonster, Milkshake, Lucky Diaz and the Family Jam Band, Little Miss Ann, King Pajama, Hey Kid!, Groovin Groceries Tunes, and Brady Rymer and the Little Band That Could. You can listen to music and audio books either through speaker or headphone jack. Downloads can be added using the USB to the memory. You could even watch videos. On the ZAZOO KIDS web site I found a couple free downloading places for children. Who was more excited over ZAZOO KIDS Photo Clock Frame, myself or the kids? It had to be a toss up. We have some early risers. I was anxious to give this a try. Because technology can sometimes baffle me I was extremely thankful the remote control is so user friendly and I was able to set it up with no problems. We have used the programmed options, moon for sleepy time and sun for wake up time. The kids know that they must stay in bed until the daytime setting comes on. They have loved listening to the music, and I have promised we would download some stories. I really like that this is a product they will use for years, even when they are older it can be just a regular beeping alarm clock if that is what they want.